Her first book tour took place in 2008 with Bon Appetit, Y’all. She’s written six cookbooks and done four big book tours. In this interview, she’s passing down what she learned and what’s new. Virginia first fell in love with cooking in her grandmother’s country kitchen. While she is best known for Bon Appétit, Y’all, her cookbook Lighten Up, Y’all: Classic Southern Recipes Made Healthy and Wholesome received a 2016 James Beard Foundation Award of Excellence. A French-trained chef, she is the former TV kitchen director for Martha Stewart Living, Bobby Flay, and Nathalie Dupree. Currently she authors the column “Cooking with Virginia” for Southern Kitchen and she’s Editor at Large for Southern Living. 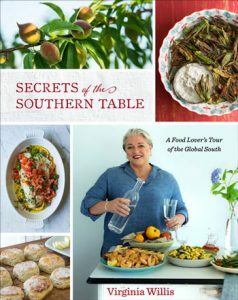 You can enter to win her lastest book, Secrets of the Southern Table: A Food Lover’s Tour of the Global South, which debuts today, by leaving a comment below. Q. Should authors still do a book tour? Some publishers considered them passé. A. Ha! I didn’t realize passé was a synonym for expensive. Kidding aside, some authors do in-person or blog tours with the aid and assistance of their publishing company. Regardless of how much a publishing company offers to do to promote, it’s up to the author to work the project, help the publicist, call in favors, and reach out to personal and professional contacts. Anyone can do this, from a first-time author to an experienced author such as myself. Plus, the book publicist assigned to you has a hard job. He or she will constantly ask for coverage in a busy and saturated media market — and most often get rejected. A tremendous amount of logistics are involved with several new books coming out at once. And, if it’s a smaller house and a smaller advance or budget, those resources are even further strapped. Q. Do publishers give authors any money towards a book tour? What might they provide? A. Each author and publisher is going to be different. It has to do with projected sales and return on demand. It’s business. For Secrets of the Southern Table and Lighten Up, Y’all, my literary agency, The Lisa Ekus Group, asked the publisher what their budget was for my tour. While some publishing companies are reluctant to divulge that information to an agent and author, we felt it would allow me to spend more wisely. I drive when I can, I stay with friends, and I pinch pennies. Q. What if there’s no budget? A. Several years ago, I wrote a small book on Okra with UNC press. It’s not a terribly appealing topic and the publisher was not able to offer much for a book tour. So I created a tour and events on my own. I approached my local farmer’s market and we hosted Okra Fest. I reached out to teach classes and tried to get the book into the hands of various influencers. My classes and events were not 100% okra menus, but I featured a dish or two. I also paired up with a chef friend. We had a food and wine dinner that wasn’t an okra-focused dinner, but my book was for sale that night. For tours, it’s a matter of thinking far enough out so that events can be scheduled. Cooking schools create their calendars sometimes six months in advance. I find that for an event to be successful, three months is good for marketing and outreach. Book tour or not, an author simply cannot expect that the sales and distribution teams are going to sell books on their own. It’s the author’s job to sell the book, too. You’re also also selling and marketing your skills, maintaining or creating professional relevance, and creating even more employment opportunities. Q. How long should a book tour last? A. As long as possible! Having said that, a new book must have a good out-of-the-gate performance. I want lots of buzz and sales in the beginning that will feed the buzz and sales as time passes. I try to be strategic about travel so that I’m going in one direction at a time. Secrets of the Southern Table will be for sale for at least the next two years. At every opportunity, this is the book I will promote and sell. Q. Who’s in charge of lining everything up, you or the publisher? A. Book tours have changed since I started ten years ago with Bon Appetit, Y’all. First of all, there are not as many cooking schools or bookstores in existence, so that changes what happens on a book tour. My publicist and I created a Google doc and we both have access to it. She’s been working on national media, social media events with content companies, and with the sales team to book events with independent bookstores. I have reached out to my professional contacts to book cooking classes, localized events such as a demo for a library, a talk at a private club, dinner with a cookbook club, and a food and wine dinner with a chef in a city where I will be on tour. I always ask her first before I book something, however. She’s got asks out that I might not know about. It’s teamwork. Q. How can you be proactive with your publisher and how do you push back if you need to? A. Ah, the fraught-challenged “pushing back.” Many authors think a publishing company has a vault filled with gold coins. And some publishers think that all authors do is ask for free stuff and drain mini bottles from hotel rooms. Neither, of course, is truly correct or accurate. First of all, I don’t push back. My literary agency pushes back for me. That is what they are there for and allows me not to be the bad guy. And, whether we push back or not is a lengthy discussion I first have with my agency. The publishing company is composed of skilled and successful people doing their jobs: creating cookbooks, designing cookbooks, editing cookbooks, and selling cookbooks. I always consider that they want the book to be as successful as I do. Most of the time I want to let them do their job – and choose my battles. Q. What’s your strategy about where to appear and promote? A. Create as many events in one place without cannibalizing the others. Arrange a cooking class and reach out to a local bookstore to see if they want to do an event while you are in town, as well. Think about paring with a chef for a food and wine dinner. Contact your library to see if they host author events. Find out if your farmer’s market has chef demos. Put the call out on social media to see who might host you at their cookbook club. Look to be included in book festivals and book fairs. Email the garden club and see if they have a tour of homes or a tour of gardens. The PTA newsletter is just as important as the New York Times. Don’t tell Kim Severson I said that, but media is media is media. Q. What do authors need to create before the book tour begins? Press release about the book. Q. Do you have any advice for authors doing their first cookbook tour? What would you have liked someone to have told you? It’s exhausting being on all the time. It’s important to take care of yourself. Right now in these months leading up to a great period of travel and touring, I’m in training mode: eating healthy, cutting back on alcohol, and exercising more. Be grateful and say thank you to each and every person that buys your book. Perhaps most importantly, pay attention to Return On Investment (ROI). Sometimes it’s not all about the money. It’s more important to see and be seen and to have book selling opportunities. Having said that, don’t work for free. It may not be for money, but there has to be a trade of value. Virginia’s new cookbook features 80 recipes, including new Southern dishes like Chicken Larb with Georgia Peanuts. Virginia’s tour of today’s South includes essays about diverse chefs, farmers and others who are shaping contemporary Southern cuisine. She shares recipes for classics such as Pimento Cheese Tomato Herb Pie and Cathead Biscuits. 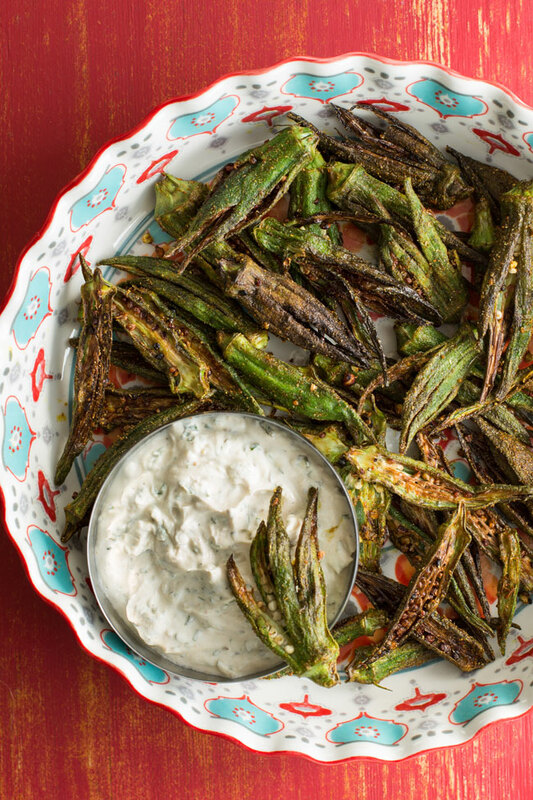 Newer recipes draw from the area’s many global influences, including Catfish Tacos with Avocado Crema, Mississippi-Style Char Siu Pork Tenderloin, and Greek Okra and Tomatoes. 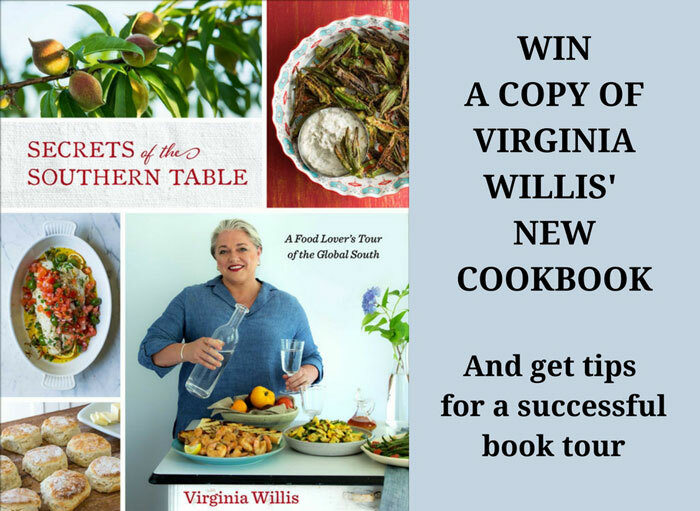 If you’d like to win a copy of Secrets of the Southern Table, leave a comment below by May 15, 2018. Also follow Virginia on Instagram. I will pick a winner at random from Random.org. This offer is available to residents of the USA only. And for more about book promotion, see this collection of posts. Love your books. Kudos, Virginia!! I am a superfan of you Virginia! My wish is to someday cook with you! I will be passing this along to a friend who publishing her first cookbook. Much valuable advice here. AND I have enjoyed your cookbooks immensely. thanks for sharing your knowledge and wisdom. It’s all about sharing and support. Thanks so much for your kind words about my books. Promoting a book is hard work, but it’s the little things that add up to be successful. Thanks for reading! Thank you so much for all this great information. A book tour sounds like tough work! I’d love to have this book. I’m just getting started with southern cooking and would love to know more! Enjoyed meeting Virginia at an IACP Conference just before one of her previous books came out. Would love to add this one to my collection, as well. Thanks for this great post! Thanks so much for having me on your shelf! I am super proud and happy about this book, so excited to share the diversity of the South. Thanks for the great advice Virginia. I don’t have a cookbook in me yet but if I ever do, I’ll heed your wisdom. I would add, as a newspaper reporter, don’t forget to reach out to your local paper. Yes, newspapers in some areas are shrinking their pages but that can mean the staff is also shrinking. Send a press release but also submit a seasonal piece with photos to the lifestyle editor. Congratulations on your latest book! Thank you for sharing the tour tips! Great interview and some good tips about book tours. Even if I’m never on one I’ll have more appreciation the next time I attend one! Your books are wonderful, Virginia! Thank you for the chance to win a copy of your new one ~ it looks like a great read and resource! I really enjoyed this interview. I’ve always struggled with promoting my books once they’re finally out there in the world, and creating a comprehensive book tour is seemly beyond my reach. I’m doing my best, but it’s still overwhelming without any help from the publisher. Any advice is always greatly appreciated. Oh wow the featured recipes sound wonderful! Great advice all around, and thanks! Your new book looks as excellent as the others!! Would love to win a copy of your cookbook! I collect cookbooks and read them like novels. I love southern style cooking and am sure I would love cooking thru yours! We would love to host you for a book signing at our house. Chefs usually sell 20-50 books depending on how many guests attend. There is also potential for a larger book signing to aspiring chefs at the CIA. Please let me know when you will be in New York? Hyde Park is less than a two hour train ride from Grand Central Terminal. Wow, I found this very genuine, practical and thoughtful advice. Thank you for being so generous!